Our staff has a combined history of more than 50 years of experience in the real estate and title industries. The staff Estates Title Agency will work to help you understand, coordinate, and close your loans quickly and accurately. Our well-prepared and experienced closers are capable of taking your title orders online and closing your transaction within 48 hours after completion of the title work. Frank has over 30 years of experience in the title business. 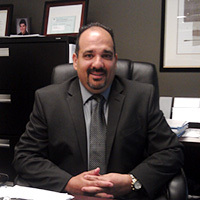 He has been with Estates Title Agency since their inception in 2001. Frank has contributed an invaluable amount of knowledge and hard work to the growth of Estates Title Agency.